Mueller indictments note WikiLeaks connections; Catherine Herridge reports. 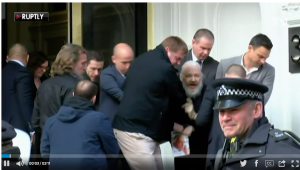 Why is it being reported today that the media is so concerned about the impacts to them from the Julian Assange arrest? The New York Times article today talks about fears that Trump will use this charge against Assange against the main stream media in the US. Interesting that the New York Times would take a 1st amendment position here, since they actively promote anti-1st amendment rights against religion and free speech. The Wall Street Journal reports that the accusations are not about the media, but there are some fears. Well, lets think about it for a moment. Are they concerned because for the last 2 years they have been taking stolen information, secret anonymous tips from supposed insiders, uncorroborated, and publishing them as factual information for the expressed purpose of bringing down the President of the United States. Maybe they have a point. Maybe their lack of accountability and lack of journalistic ethics are about to expose them to greater penalties than just being the laughing stock of the citizens of the country. The WikiLeaks rogue is indicted for conspiring to crack U.S. databases. Russian hacking is now news, why? WikiLeaks Email Dumps. Yes They Matter? The Russians Did It For Trump! Hannity Destroys Russian Hacking Hoax!